We’d love your help. Let us know what’s wrong with this preview of Chance by Archie Hellshire. Daniel has spent his life traveling down the same well-worn path, safe inside a prison of his own making, with tomorrow promising no difference from yesterday. Then, one unremarkable morning, he meets someone who throws his life completely off the rails. All he knows about Nathan when he first sees him is that he’s beautiful, but it’s enough to get him to board the wrong t Daniel has spent his life traveling down the same well-worn path, safe inside a prison of his own making, with tomorrow promising no difference from yesterday. Then, one unremarkable morning, he meets someone who throws his life completely off the rails. All he knows about Nathan when he first sees him is that he’s beautiful, but it’s enough to get him to board the wrong train instead of going to the office. Smart, witty, shockingly entertaining. A short, quick read full of high octane fun. Daniel is a risk analyst at an insurance company. He lives a life of rigid schedule. It could be called robotic if not for the occasional pang of loneliness. Nathan is a college student working through school as a parcel delivery man. Neither lead very exciting lives until they accidentally run into each other and into an unforseen situation that sets them on the run from men determined to catch them. Let the fun beg Smart, witty, shockingly entertaining. A short, quick read full of high octane fun. Fantastic story. Great MCs. Even greater secondary characters. So much fun! I definitely recommend this one for a few short hours of perfect escapism. Chance is a really fun, high energy story that I enjoyed quite a bit. It is a shorter book, but it packs quite a lot into a few pages, taking us on a whirlwind ride that kept me entertained throughout. The book opens with us seeing a regular day in Daniel’s life. This guy is about as regimented as it is possible to be and he thinks through every decision to all possible ramifications before taking any action. He is adorably over the top (the whole story is laced w A Joyfully Jay review. The book opens with us seeing a regular day in Daniel’s life. This guy is about as regimented as it is possible to be and he thinks through every decision to all possible ramifications before taking any action. He is adorably over the top (the whole story is laced with a bit of absurd humor and amusing asides), and I found him endearing despite the fact that he would drive me nuts in real life. Then Daniel does something he has never done before, and that is take a chance, act on a whim, and follow a hot guy on the subway. And of course, that one action blows his life up into total chaos, but in kind of an awesome way, as long as you ignore the guys trying to kill him. Author Archie Hellshire takes us on a wild, breathless ride as these guys are all over the city, getting in and out of trouble as they try to avoid the bad guys and figure out just what they want with Nathan. It is fun and exciting and high energy. I picked up this novella in hopes for something a bit different and Chance certainly offered that. A shorter read that covered a lot of action and story in a relatively brief period, Chance detailed the exciting, peculiar events of what started out as another ordinary day for risk analyzer, Daniel, and courier, Nathan. I don't quite know what it was about this book, but I was really captivated by it. Daniel was a character driven by (what it seemed to me) a lot of OCD and fear of things not falling into the specific routine he imagines. He likes things just-so, and doesn't seem to interact with people much. When he sees an attractive man on the subway after his morning's routine has already gone a little off schedule, he finds himself wanting to put himself out there. Of course, nothing is as simple as it shou I don't quite know what it was about this book, but I was really captivated by it. Daniel was a character driven by (what it seemed to me) a lot of OCD and fear of things not falling into the specific routine he imagines. He likes things just-so, and doesn't seem to interact with people much. When he sees an attractive man on the subway after his morning's routine has already gone a little off schedule, he finds himself wanting to put himself out there. Of course, nothing is as simple as it should be, and Daniel ends up getting much more than he bargained for. Nathan is a courier who just delivers packages. Someone attempts to mug him on the subway, Daniel helps him out, and they end up on the run from much more than a mugging. I definitely had to hit the "I believe" button a few times. Their escapes from danger seemed too perfect at times, but I was intrigued and rooting for Daniel and Nathan as they tried to get to safety. This was enjoyable, and I'd be curious what book 2 would entail. Hopefully it would show us what happens next, because it did feel a little unfinished at the end. I received this book as an ARC thanks to Net Galley and Nine Star Press! 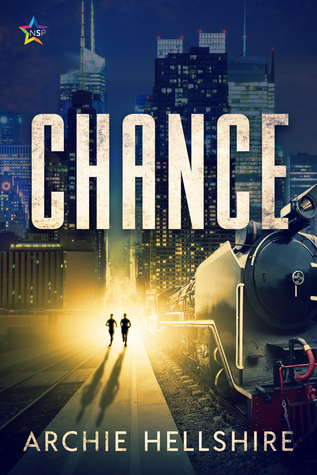 chance was an intense fast-paced thrilling ride of a story with a suddenly sweet love story! Chance is the story of Daniel a tightly wound man with a strictly scheduled life that he loves to live by. That is until the day that he runs into Nathan and the race is on from there in this story of chases intrigue and Chance and how all of those things can change a life in ways one would never have imagined! not only did I love Da I received this book as an ARC thanks to Net Galley and Nine Star Press! Overall, 2 stars out of 5. This novel was a struggle to read. Especially at the beginning, I would have to re-read each chapter because I could not absorb myself into the book. It seemed that the language was lacking, the characters were rather uninteresting (especially the main character, Daniel), the romance was lacking, the small details were off and very unrealistic and the book overall was just boring. When it nears the end, it improves slightly, but it was very difficult to get past the fir Overall, 2 stars out of 5. DNF. A short story that I just couldn't keep track of what was going on. Archie Hellshire is an author with aspirations of being able to write. He was born in the Caribbean where he developed a love of nature, the metric system, and high temperatures. In school, lacking any athletic or social ability, he became a very bookish person, indulging in the works of Douglas Adams, Terry Pratchett, JK Rowling, and Charles Dodgson. Despite being well read, he struggled with dys Archie Hellshire is an author with aspirations of being able to write. He was born in the Caribbean where he developed a love of nature, the metric system, and high temperatures. In school, lacking any athletic or social ability, he became a very bookish person, indulging in the works of Douglas Adams, Terry Pratchett, JK Rowling, and Charles Dodgson. Despite being well read, he struggled with dyslexia and would forever remain horrible at spelling. The advent of Spell Checker reignited his dreams of becoming an author.